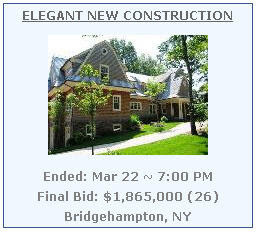 Two weeks ago a couple of brokers in New York had great success running an online auction for properties in the Hamptons. A Prudential Douglas Elliman-sponsored online auction, run by brokers Vince Horcasitas and Enzo Morabitohas has helped bring buyers back to the market. During the eight days that online bidding was going on, the activity surrounding the houses was significantly improved over what it had been and what other, non-highlighted properties, saw. In three days of open houses, Mr. Morabito and Mr. Horcasitas and their associates showed the 17 properties more than 100 times. In all, 50 bids were entered over the eight days the auction was live by a total of 14 different bidders. Most of the bids came on Sunday, the last day of bidding.